Reports on the purported intentions of a Dutch company to invest in the textile industry in Uzbekistan went viral online. After all, an alleged amount of 50m USD is quite a significant amount to capture Uzbek and Russian online media outlets’ attention. This agency was no exception, because our audience and we are interested in the issues related to the Uzbek economy; especially problems with the foreign investments. We have written numerous pieces of news and articles on how foreign businesses face challenges in Uzbekistan given the bureaucratic hurdles and rampant corruption. Many foreign businesses had to leave the Uzbek market and their money therein, when coming to an agreement with local officials proved impossible. The textile industry begs for special attention. Anything remotely or closely related to the Uzbek cotton has been arousing serious suspicions among European and American buyers. The whole world knows that child labour was actively employed in Uzbekistan for collecting cotton. While this form of forced labour is subsiding, adults are being forced to pick cotton as slaves, however removed they are from agriculture – doctors, teachers, etc. Therefore, information about some Dutch investors’ interest in contributing investing money into cotton processing in Uzbekistan stirred quite a surprise. Our readers might have experience similar sentiments. So one of them went an online quest to dig up information about the investment company in question – LT Textile Cooperatief UA, and was surprised when virtually no information came his way. The inquisitive reader’s findings stirred this agency’s interest as well. We have, therefore, consulted the website of the Chamber of Commerce of the Netherlands, which houses information on all the registered legal entities. Having paid seven-and-a-half euros, we learnt that LT Textile Cooperatief UA Company was registered in Amsterdam quite recently on June 24, 2014. According to statutory documents, the company in question is engaged in holding and financing activities in the textile industry. The company is assigned the SBI-6420 code, which can only be issued on behalf of a holding company. Four individuals founded the company: Iwan Petrus Leonardus van Munster, a lawyer specializing in international economic law; Daniël Willem Gustaaf Kwantes; and two citizens of the People’s Republic of China Yaowu Wang and Hao Jin. That said, Mr Jin was registered as a cofounder only last September. Searches for more information on the latter two gentlemen from open sources proved futile. It is rather curious that the company’s staff is zero. Yes, zero, because the LT Textile Cooperatief UA Company employs no CEOs, no secretaries, and not even security guards. Seemingly obtaining a legal mailing address was the most important aspect of registering the company as that makes the company eligible for opening a bank account. Rather limited information on the company, don’t you think? In order to learn more about this courageous European investor, which decided to invest millions of dollars into the Uzbek cotton processing despite an international boycott, we called the +31205755600 phone number. Although the number was indicated as the contact information for LT Textile Cooperatief UA in the Dutch registry of legal entities, a female voice made our efforts fruitless. Fergana: Hello, is this LT Textile Cooperatief? Your phone number is indicated in the contact information for LT Textile Cooperatief, so I would like to speak with someone from this company. There was news that this company is planning to invest into the textile industry of Uzbekistan, and I would like to learn the details of this project. Do you know how I could get in touch with them? My name is (...), and I represent a news agency that covers events in Uzbekistan. Yes, I am a journalist. But you do confirm this company is your client, right? What is TMF and what is “booking”? We almost lost hope we could contact head of the company. However, just to try our luck, we looked at Facebook – it is indeed a treasure trove of most intimate and personal information. Imaging our surprise when we found out that the chief founder of LT Textile Cooperatief UA, Iwan Petrus Leonardus van Munster, is also head of customer relations department at that very TMF-Group. Mr. van Munster shares that information on his Facebook page. All right, what does TMF do? Shall we look at their official website? So, TMF registered the LT Textile Cooperatief UA Company in order to provide services related to its investments in Uzbekistan. Well, nothing wrong with this situation and no unlawful activities can be found, of course. In order to understand if this case is indeed one of those “nothing-wrong-with-it” cases, we contacted an expert in the field of international investments. The expert is certain that everything here is legal, but he assumes the situation is not quite the way mass media are portraying it to be. According to this expert, the Netherlands is renowned for its textile industry. There would be, therefore, no illogicality if a well-known company was interested in investing into the Uzbek economy’s textile sector. But, the fact here is that this investor is unknown, while the registering body has immediately inked an investment agreement with the Uzbek government. This situation indicates much was left behind the scenes. Disclaimer: The following is nothing but our interlocutor’s assumptions. On the other hand, then, who would be interested in announcing such activities so openly? We pay due respects to business interests of both Uzbekistan and the Netherlands, and we have no intention to pry on commercial secrets. However, we believe the issue of investing into the cotton industry of Uzbekistan, which remains one of the most problematic issues in this country, is an extremely important one as it touches upon the entire Uzbek society’s interests. The interests of those very people who work on cotton fields like slaves, collecting “white gold” and receive no dignifying monetary or any other reward for it. P.S. 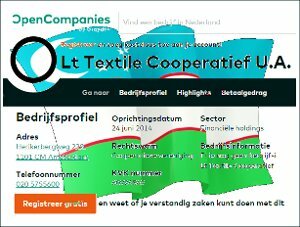 We withheld from publishing this article until the very last moment in hopes to receive comments from the chief founder of LT Textile Cooperatief UA, Mr. Iwan van Munster. All of his phones were responded to by a secretary at the TMF-Group. The young lady would either say Mr. Munster is “in a meeting” or try to connect us to him and he would not pick up the phone.